Warmer weather may be slowly getting to some of us in the northern states, but it really is coming. Now's the perfect time to start your search for summer beach reads. You know those books you bring to the beach and just can't put down. I've got a great book for you. Best of all, you can win a copy of your very own! Landslide is the story of Jill and her lifelong friend, Susie, who grow up in a remote mountain garden. The Garden's realm has many rooms, each a showcase of designs by Jill's mother. When tragedy strikes in the Garden, how does a child find the resilience to go on? 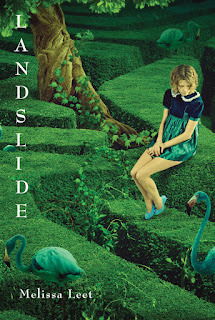 Alternating between Jill's childhood and adult life, Landslide depicts the adventure that happens when life is lived full out, regardless of consequences. As the girls come of age, mature, and find love, the Garden is a constant, reverberating through their psyches and in their hearts. Teeming with poignancy, humor, and love, Landslide is a resplendent exploration of resurgence, and the truth that even death can reveal paths as wondrous as those created by life. Do you want to read the first chapter of Landslide by Melissa Leet? Here you go. To enter, go to the Roundtable Reviews Facebook page and like or comment. Contest is open to U.S. residents only. You can also enter by emailing roundtablereviews (at) gmail (dot) com.